One of the greatest moments on a golf course—aside from a hole-in-one, albatross, eagle or birdie—can happen as soon as you step up to the first tee and take in the spectacular view of ocean, countryside or distant snow-topped mountains. It’s mesmerizing, really. Course designers go to many lengths to make sure every golfer’s experience is one that’s not only challenging, at times, but also unique and to some extent surreal. 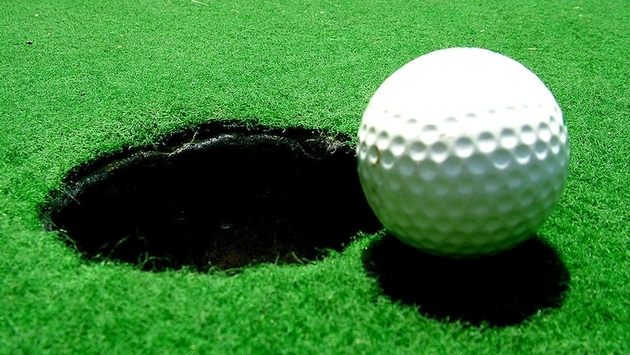 There are, however, differences amongst golfers as to preferred terrain. Traditionalists fancy links courses, fashioned after St. Andrews, the first golf course built in 18th century Scotland. True linksland is located along the coasts of Scotland, Ireland and England, though some American links are also characterized by the natural rolling sand dunes and fine fescue fairways that define the traditional sport. A links course plays faster than contemporary golf and strong winds are considered a feature of the hit and run game. While many newer courses in the United States and in other parts of the world have attempted to emulate links courses, the average golf course is one that’s been heavily groomed. Land is dug up to create bunkers and poured elsewhere to build dogleg bends and artificial dunes. What you’ll find in this list of golf’s spectacular views are courses that supersede design type or player preference. To visit these courses is to be transported to a near-spiritual plane—as if living in a dream. There’s an old saying in China that goes, “If you have visited Kunming without seeing the Stone Forest, you have wasted your time.” OK, so it’s not as deep as Confucius. But the same can be said about not visiting Stoneforest International Country Club just outside Kunming City. Covering an area of 60,000 acres, Stoneforest boasts three 18-hole championship-level courses, Yufeng Ridge, Master’s Resort and Leaders’ Peak. Located in the southwestern mountains of China, at 6,500 feet, architect Brian Curley utilized nature’s ancient art by building around the massive 300-million-year-old karst limestone walls and formations for an awe-inspiring backdrop that is sure to help you get in the zone. PHOTO: The 16th hole at Cabot Links. All course photos courtesy those pictured. Walking across the fine fescue that covers the sandy dunes of Cabot Links and looking out beyond the salty mist that hovers above the St. Lawrence Gulf, you might think you’ve transported to the Old Course at St. Andrews in Scotland. You wouldn’t be far off. 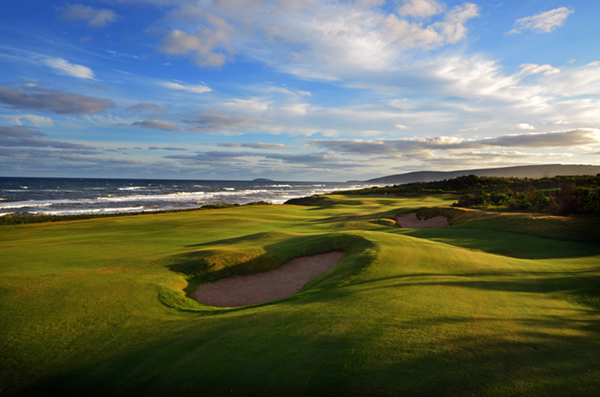 Canada’s first authentic links course is situated in the quaint town of Inverness on the rugged shores of Cape Breton Island in the province of Nova Scotia (Latin for New Scotland). As if a sculpture creating a master work of art, designer Rod Whitman (also a long-time shaper for legendary architects Bill Coore and Pete Dye) considered every detail when building the course above an old coalmine. Natural dunes and bunkers give Cabot Links a traditional golf vibe and a charm that’s nearly incomparable. With its exquisite countryside and mountain landscapes, some consider Minnesota “God’s Country.” So it makes sense that Superior National at Lutsen made this list. Overlooking Lake Superior and nestled up against the Sawtooth Mountains, three interwoven 9-hole courses (Mountain, River and Canyon) make up the Audubon Cooperative Sanctuary-certified grounds. An occasional whitetail deer, fox or moose can be seen gracing the land. Come autumn, when the tree leaves have changed color, if you stand at hole six on the Canyon Course and look toward the 2nd hole on the River Course, you’ll see a blanket of gold and orange, red and green that seems to go on forever, through which flows white-water cascades of a majestic river. Due to major renovations, the River Course will be closed until summer 2015. PHOTO: The 5th hole at The Boulders Club. “Any golf course in a town called Carefree is the place you want to be,” may as well be the theme song to this Arizona resort club, just north of Scottsdale. 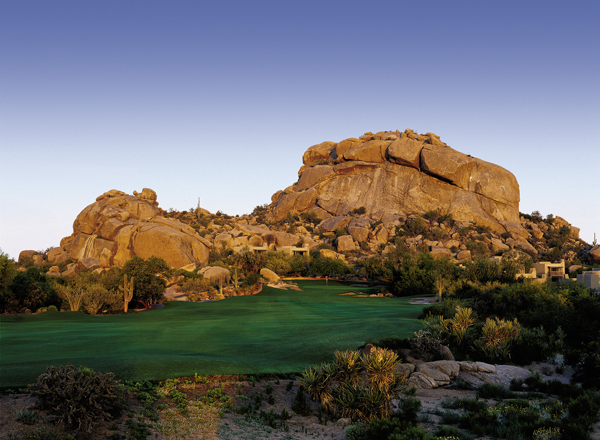 Magnificently situated on 1,300 acres in the Sonoran Desert, The Boulders course is surrounded by 12-million-year-old granite rock formations interspersed throughout most of the South and parts of the North Courses. Architect Jay Morrish did a brilliant job of creating two distinctive courses. Where the South’s scenery is more dramatic and the course more challenging, the North offers wider, forgiving fairways and some enormous cacti to play through. The course isn’t open to just anyone, however, if you want to play, you have to stay at the resort. 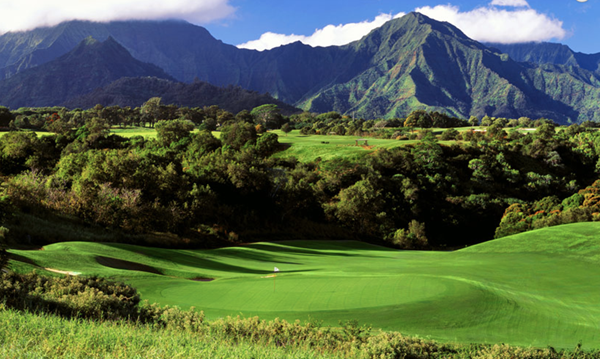 Not to take anything away from the other remarkable courses in the Hawaiian Islands—because many could easily make a “Golf’s Spectacular Views” list—but the Prince Golf Course at Hanalei on the Garden Island of Kauai is nothing short of heavenly. Staying true to the land’s original beauty, designer Robert Trent Jones II focused on the panoramic view of tropical forest, regal jagged-edged volcanic mountains of the Na Pali Coast in the distance, and of course the humbling Pacific Ocean. Along the course, you’ll find ravines overflowing with guava and mango trees, gentle waterfalls leading to peaceful flowing streams, and likely a gecko or two. The 350 acres of lush tropical land underwent a multi-million dollar renovation in 2012, widening the fairways, remodeling some of the bunkers and clearing the overgrown vegetation to revive the Prince to its original majesty. An old Irish blessing says, “May you never want for more.” Golfer or not, if there comes a time that you find yourself standing on the Old Head of Kinsale Links, looking out across the dark blue Atlantic, with the 150-year-old black and white striped lighthouse in its foreground, you’ll know you’ve received your blessing. Located in County Cork on the southwest coast of Ireland, this private club offers cliff views from half of the course, and the ocean is visible from every hole. One of the most intimidating yet mesmerizing holes is 12, the “Courcean Stage,” which begins with a semi-blind drive over the edge of a cliff onto a narrow ridge that towers some 200 feet above the sea. PHOTO: The iconic hanglip at Legend Golf and Safari. 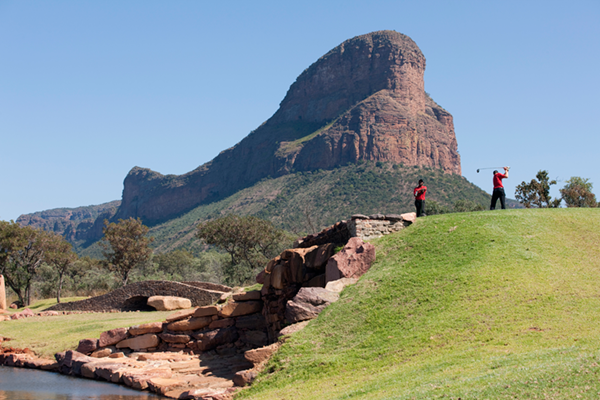 Legend Golf and Safari is located in the northern-most region of South Africa—the malaria-free zone, mind you—in the province of Limpopo at the Entabeni Safari Conservancy. Surrounded by the subtropical woodlands, it’s not uncommon to see nonthreatening wild animals such as zebra, giraffe or blesbok parading through the rough. Nearly every view from the 8,500-yard-stretch of land is breathtaking, and uniquely each hole is the design of a different PGA golf pro. The most jaw-dropping view of all is from the top of a sandstone mountain called Hanglip, which can only be reached via helicopter. At the Extreme 19th tee box, 1,200 feet above the Africa-shaped green, hopeful golfers have a chance to win $1 million on a hole-in-one. 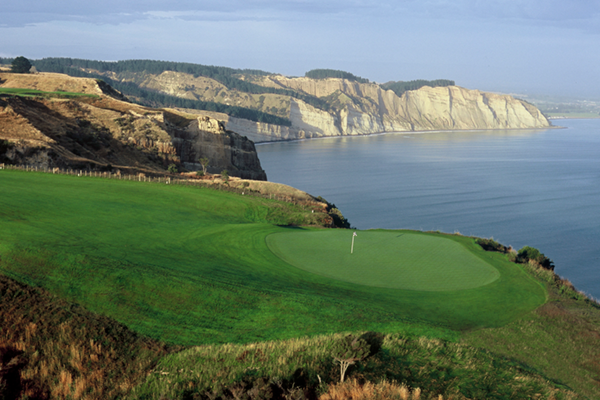 PHOTO: The 15th hole at Cape Kidnappers Bay. It can easily be said that Pacific Dunes’ architect Tom Doak ultimately mastered his craft when he designed Cape Kidnappers Golf Course in New Zealand. Built against a picturesque landscape some 500 feet above the stark-white cliffs of Hawke’s Bay, the back nine fairways are sprawled across multiple finger-like ridges that are separated by steep ravines. While some of the most spectacular views look out toward the South Pacific, from a golfer’s perspective one of the most dramatic shots is from the crest of the fairway on the seventh hole, looking down into the valley and out across the endless emerald countryside. The property’s lodge, The Farm at Cape Kidnappers, isn’t too shabby either. In fact, it’s been ranked one of the top 25 hotels in the world. PHOTO: The 18th hole at Erin Hills. “If you build it, he will come.” While the message from Field of Dreams was originally intended for a small midwestern baseball field, the significance couldn’t be more fitting for Erin Hills in Hartford, Wisconsin. Opened in 2006 as a work-in-progress by then-owner Bob Lang, the course was designed with the dream of it hosting a future US Open. Architects Ron Whitten, Michael Hurdzen and Dana Fry saw the 650 acres of glacial dunes, steep drops and blind pockets for more than cattle grazing land and turned it into a natural links course. 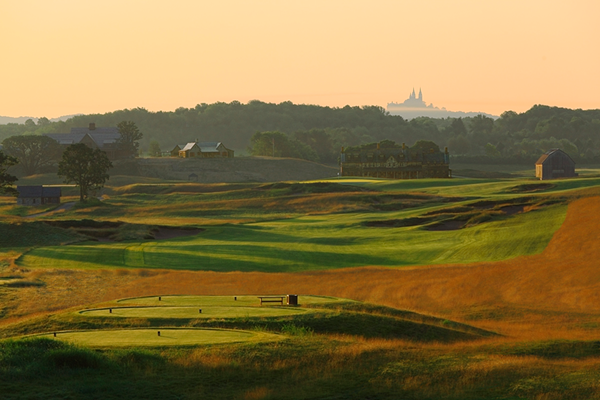 Bright green fescue fairways present a striking contrast to the countryside’s golden-brown grasses, adding to Erin Hills’ uniqueness. In 2009, the new owner Andy Ziegler made it a walking-only course to protect the fescue and add to the traditional experience. After years of dreaming, making minor adjustments and planning, the course will see its first US Open in 2017. 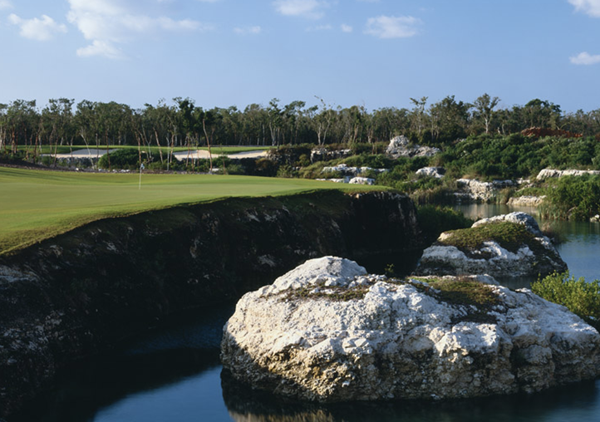 Aptly named the chameleon for its changing scenery, El Camaleón Golf Club at the Mayakoba Resort in Playa del Carmen is the only course in the Riviera Maya that nestles right up to the white-sand beaches of the Mexican Caribbean. Fairways twist through a tropical jungle, from which an occasional reptile makes a surprise visit (crocodiles have been seen on the resort’s property), and some of the Greg Norman-designed course displays bountiful mangrove trees, lagoons and natural limestone cenotes (underground salt or fresh water caverns). A canal that runs through the property is also used to transport golfers directly from their rooms to the first tee. Not only are the sights of this course something to behold, but the Audubon Society and United Nations World Tourism Organization have also recognized El Camaleón for its high standards of nature preservation and sustainable development.